The pontiff gave his first full-length, wide-ranging interview to an Italian Jesuit journal. IN HIS FIRST full-length and wide-ranging interview, Pope Francis has criticised his own church for becoming “locked up in small things and small-minded rules”, admitting that he has avoided certain topics on purpose despite being reprimanded for doing so. Speaking to Italian Jesuit journal, La Civilta Cattolica, the pontiff said there is no need to talk about abortion, gay marriage and the use of contraception “all the time”. The pastoral ministry should not be “obsessed” with the a “disjointed multitude of doctrines to be imposed insistently”, he added. We cannot insist only on issues related to abortion, gay marriage and the use of contraceptive methods. This is not possible. I have not spoken much about these things, and I was reprimanded for that. But when we speak about these issues, we have to talk about them in a context. The teaching of the church, for that matter, is clear and I am a son of the church, but it is not necessary to talk about these issues all the time. The interview was published in 16 Jesuit journals today, including the New York-based America journal, which translated the entire 12,000 transcription into English. Much of the content focused on being a Jesuit and the future direction of the church. We need to proclaim the Gospel on every street corner, preaching the good news of the kingdom and healing, even with our preaching, every kind of disease and wound. In Buenos Aires I used to receive letters from homosexual persons who are ‘socially wounded’ because they tell me that they feel like the church has always condemned them. But the church does not want to do this. During the return flight from Rio de Janeiro I said that if a homosexual person is of good will and is in search of God, I am no one to judge. By saying this, I said what the catechism says. Religion has the right to express its opinion in the service of the people, but God in creation has set us free: it is not possible to interfere spiritually in the life of a person. The church cannot be herself without the woman and her role. The woman is essential for the church. Mary, a woman, is more important than the bishops. I say this because we must not confuse the function with the dignity. We must therefore investigate further the role of women in the church. We have to work harder to develop a profound theology of the woman. Only by making this step will it be possible to better reflect on their function within the church. The feminine genius is needed wherever we make important decisions. The challenge today is this: to think about the specific place of women also in those places where the authority of the church is exercised for various areas of the church. 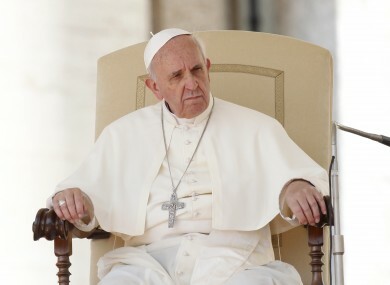 Email “Pope Francis: We don’t need to talk about abortion, gay marriage and contraception ‘all the time’”. Feedback on “Pope Francis: We don’t need to talk about abortion, gay marriage and contraception ‘all the time’”.